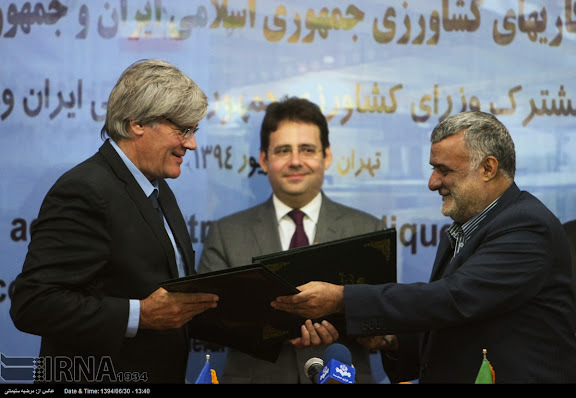 Left to right: French Agriculture Minister Stephane Le Foll, French Trade Minister Matthias Fekl and Iranian Minister for Jihad-e-Agriculture Mahmoud Hojjati, with signed MoU on 21SEP15 in Tehran. A senior French economic and political delegation heads to Tehran on Sunday to lay the groundwork for the first business contracts between France and Iran since an accord to curb its nuclear program in July. France's main business lobby group, the Medef, is sending a delegation comprising more than 100 firms to Iran, including companies such as oil major Total, planemaker Airbus and car manufacturer Peugeot. The delegation includes most of France's CAC 40 companies, but also small and medium enterprises with sectors as wide-ranging as agriculture, finance, luxury goods, pharmaceuticals, construction and transport represented. 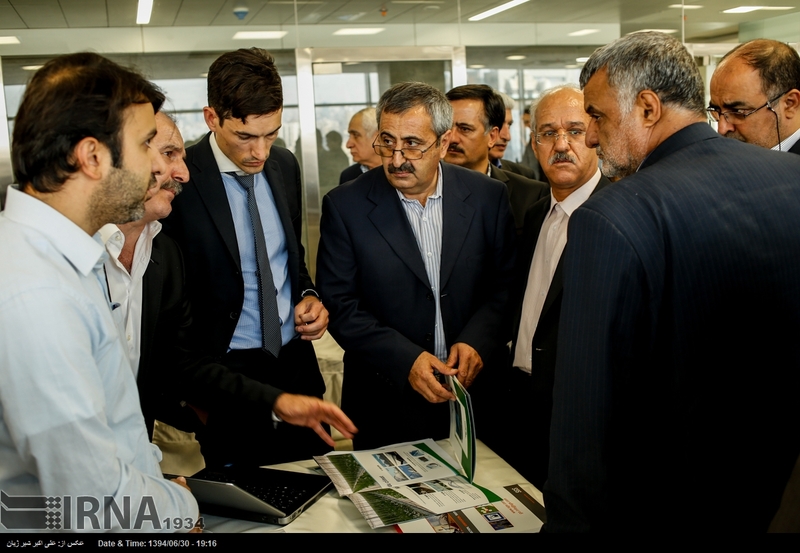 Heading it up are Agriculture Minister Stephane Le Foll and Trade Minister Matthias Fekl, who will open a new trade office in the Iranian capital on Sept. 22. COMMENTARY: It was predicted that European entities would show an interest in renewing economic ties with the Islamic Republic following the signing of a nuclear agreement, however the rush and scope of interest can still be characterized as remarkable. It is regrettable that American domestic politics appear to preclude American business interests from participating full-force in this projected business bonanza. 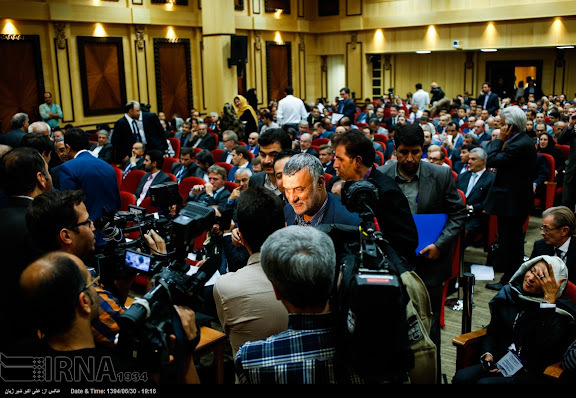 The MEDEF (Mouvement des entreprises de France) delegation exchange with Iranian business leaders appears in some aspects to resemble a convention. Iranian Minister for Jihad-e-Agriculture Mahmoud Hojjati with business leaders inspecting French business brochures provided by a representative from one of France's CAC 40 companies. If Iran was smart they would give China and Russia the advantage here. The Europeans completely abandon the country during a time of need so they're not reliable . @ anonymous: Iran needs to have open and deep economic relationships with the rest of the world and not look back. The road to ruin in the last 100 years in Iran has been lack of corporate governance in economic relationships with world powers. This has meant that political considerations take precedence over countries best interests. Initially it was the British, then Americans, then Palestinians Hizbullah and Syrians and Chinese and Russians... All Chinese and Russians did was to support a very corrupt and dirty regime of Ahmadinejad in power by taking Iran's oil keeping billions of dollars and paying bribes to Ahmadinejad and his corrupt supporters. What they did to Iran is far worse than America and Shah. In fact we must attack their embassies burn their flags and take Syrians hizbullahis and Palestinians hostage (the last sentence is a joke of course).